The AUD/USD experienced a winning streak of four bullish candlesticks last week. The AUD/USD broke away from the downward sloping trend in place since this February. The labor market pickup is expected to support Aussie as employment is set to rise 20K in October. The second week of November was remarkable for the Australian Dollar has the Aussie finally broke away from the downward sloping trend channel against the US Dollar namesake that started back at the beginning of this February. The Aussie took the advantage of the US Dollar softness ahead of the US Mid-term elections and the actual elections results. The US Democratic party took over the House in the elections while Republicans retained the Senate. The US President called the results a victory, but the currency market saw the results as a reason to sell the US Dollar across the board. It was the US Federal Reserve bank that has finally reversed the trend as the AUD/USD appreciated from 0.7186 to 0.7302 from Monday to Wednesday ending the week around 0.7250. Part of the Aussie’s stemmed from the outlook for the economy from the Reserve Bank of Australia (RBA) that decided to leave the cash rate unchanged at 1.5% in line with market expectations with the main reasons behind the decision largely unchanged from the previous meetings. The RBA repeated its outlook for continuous global expansion with China slowing a little due to international trade uncertainty. Nevertheless, the outlook for Australian business conditions and the Australian labor market remains positive, although household consumption is a source of uncertainty. The RBA expects a gradual lift in wages growth and a further gradual decline in the unemployment rate with implications for Australian inflation to pick up in 2019 and 2020. Technically the AUD/USD has broken the long-term downtrend and need to keep above 50-day moving average and the upper band of the downward sloping trend channel to confirm the sideways trend or a trend reversal. The Relative Strength Index is already moving lower and the Slow Stochastics made a bearish crossover in the overbought territory. Should the pullback withstand the 0.7200 level, the next directional movement for Aussie should be on the upside targeting 0.7380, August 21 high. On the macro front, there is not much to look at in Australia during the next week with the exception of the labor market report due next Thursday. The unemployment rate in Australia is expected to tick up to 5.1% in October while employment is expected to increase 20K in October, up from 5.6K in the previous month. 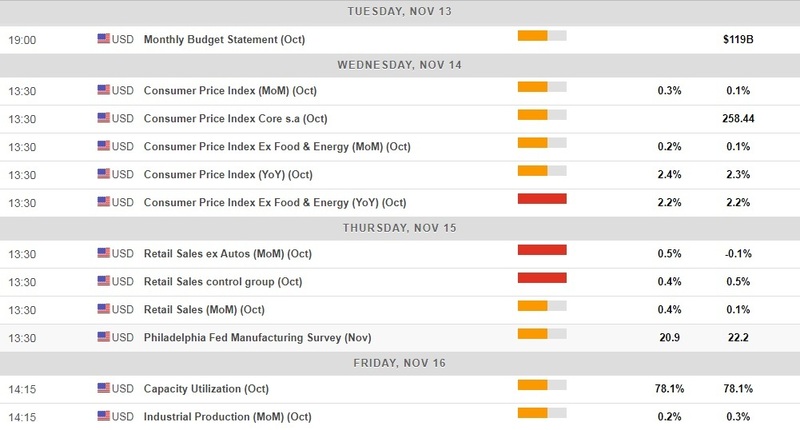 The US economic calendar is scheduled to deliver the inflation and the retail sales data in the week ahead. The US headline inflation is expected to accelerate to 2.4% over the year in October while core inflation is expected to remain unchanged at 2.2% y/y, the US Labor Department data are scheduled to show next Wednesday. On Thursday next week, the US retail sales are seen increasing 0.4% over the month in October while the core retail sales stripping the basket off auto sales are expected to rise 0.5% m/m after falling -0.1% m/m in the previous month. According to the FXStreet Forecast Poll, the AUD/USD pair is bearish in a short-term horizon but remains bullish in the 1-month and 3-month time frame. The opinions about the short-term view are evenly split with 40% of market analysts expecting a bullish trend in 1-week time while 47% expect the bearish trend to prevail. For the 1-month time, the AUD/USD is expected to reach 0.7256 with 52% of experts projecting bullish trend and 44% expecting a bearish trend. In a 3-month time frame, the AUD/USD approached the targeted level of 0.7340 with 48% bullish versus 30% bearish forecasts.